This may come as quite a shock to some, but you can’t trust all movie advertising. 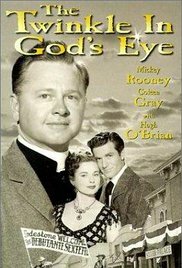 I found The Twinkle in God's Eye on Amazon Prime, and the film summary states, “A minister returns to Lodestone, the Western town where 25 years ago his father was killed when his church was burned down. His method of conversion is humor.” Now that first line is a reasonably factual plot summary, but I have problems with that second line. Mickey Rooney plays the Reverend William Macklin II, a seminary graduate with a two week old degree who goes from the East Coast to an old West town where his father had served. I went into the film with the hope that the character would have a razor sharp wit and joyous winning spirit that would seem to be needed to use humor as a conversion tool. Instead, the good Reverend is not too bright and is often rather glum. When he arrives in town, he goes into the Silver Palace Saloon and asks where the church is, which brings a response of laughter. He seems taken aback by this. Did he expect the customers of a saloon to spontaneously ask about service times? A man in the bar asks, in a quite hospitable way, to treat the Reverend to a drink. Rev. Macklin II, without a hint of self-awareness, orders a glass of milk. He seems surprised when the bar again erupts in laughter. The bartender tells him a glass of milk would cost $4, much more than whiskey or beer, because ice doesn’t come cheap in the old West. The man says he’ll still treat but the Rev. refuses. And his cluelessness does not let up as the film goes on. Reverend Macklin (II) finds the spot where his father’s church was burned down -- which happens to be right behind the Silver Palace Saloon. He goes on to make life miserable for Marty, the owner of the saloon, setting off an avalanche that breaks saloon windows. He promises to pay for them, but he has no money. He tries to call people to church with a bell that has served as the town alarm for mine disasters. He frightens people in the saloon when he practices shooting his pistol. Understandably, Marty wants the Rev. to move. Marty offers to build a church on the other side of town, which I thought was quite generous. The Rev. refuses, saying he has his reasons. I understand the sentiment of wanting to carry on his father’s work at the same site, but why not explain that to Marty? Shouldn’t he try to be a good neighbor to Marty instead of a pain in the neck? 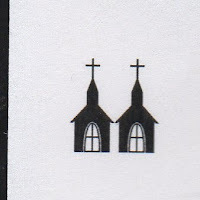 It’s unclear under what denomination affiliation (if any) the Rev. Macklin operates, though he is obviously not Catholic as he is following in the footsteps of his married father. He posts a sign for his services that reads, “Sunday Service – 9 AM at the Old Church Site Directly behind the Silver Palace – All Faiths Welcome.” Even though all faiths are welcome, one gets the feeling that any of the Jews, Muslims, or Hindus in this old West town might be distinctly disappointed. Though he is single and a Protestant, he is oblivious to the saloon girls who find him attractive. He seems less bright than just about everyone in town, but he does have something to teach the local Indian population. They’ve been starving ever since the white man dammed the river they used to fish. Rev. Mick teaches them how to fish in the lake with a pole (previously they only knew spear fishing). But the Rev doesn’t minister to them in any other way; he just wants their lumber for his church. In the climax of the film, the Rev does come through in a couple of ways. When there is a cave-in at the mine, he offers the lumber intended to build the church to aid in the rescue, saying, “The church was built for men, not men for the church” (echoing Jesus’ words about the Sabbath). And he does take time to pray for the men in danger. Jesus said in Matthew 10: 16: “I am sending you out like sheep among wolves. Therefore be as shrewd as snakes and as gentle as doves.” When the Rev. Macklin goes out to Lodestone, he is pretty darn gentle, but he’s as shrewd as a sheep. And you just don’t win over many wolves that way. 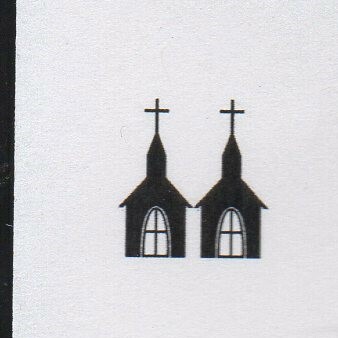 I’m giving him and his church two steeples.